José Martínez rejoins the Cardinals after welcoming his daughter into the world over the weekend. José Martínez became a father for the first time over the weekend, which is why he wasn’t around for the Cardinals‘ weekend series with the Cubs. But he’s back from paternity leave and with the Cards as they open a seven-game road trip Monday night in Philadelphia. The team activated Martínez from the paternity list Monday and returned his replacement at first base, Luke Voit, to the minors. Voit was assigned to Triple-A Memphis. 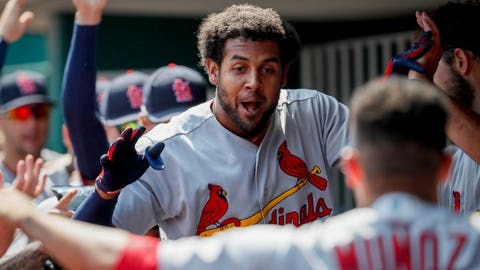 The Cardinals have activated 1B José Martínez off the Paternity List and have optioned 1B Luke Voit to Memphis (AAA). Martínez returned to Venezuela for the birth of his daughter. He rejoins the Cardinals as the team leader in batting (.321), home runs (10, tied with Matt Carpenter, Marcell Ozuna and Tommy Pham), RBIs (42), slugging percentage (.517) and OPS (.906). Also Monday, left fielder Marcell Ozuna was named NL player of the week after batting .455 with four home runs and eight RBIs in six games last week.